Last year, I created a few simple tutorials on coloring--one on coloring with prismacolor pencils and one with Copic markers. 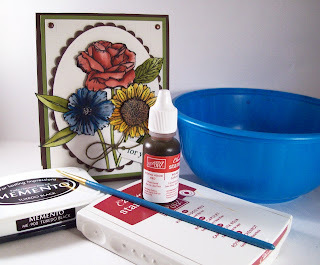 After my post the other day with the watercolored flowers, I received a lot of emails asking how I did it...so today I thought I would show you how EASY it is to paint with Stampin' Up! reinkers. My goal this year is to create level II tutorials for all of the coloring mediums I have already done. I really love using lots of different coloring mediums and have found that most are a lot easier to use than they appear. I am going to list all of my coloring tutorials on the sidebar of my blog shortly so they will be easier to find. I choose to use a thin paint brush when watercoloring because it gives me more control. I have used an aquapainter before and find that sometimes it drops more water than I want when I squeeze it. You may prefer to use an aquapainter and that is fine. It is just a matter of personal preference. 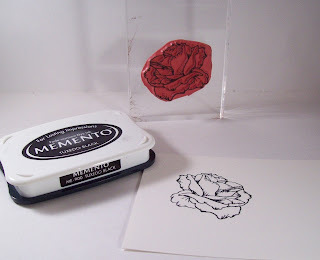 Stamp image on watercolor paper. 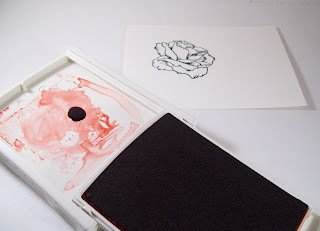 Step 2: Squeeze a drop of reinker on the inside of the stamp pad (or plastic plate). If you are using more than one color on an image, prepare all inks for that image the same way. For this image, I simply used Riding Hood Red (SU!). You can get several shades from each color so for some images you can use one reinker to color. That is one of the reasons I love watercoloring. Step 3: Dip brush in water and mix with some of the ink to create lighter color. Now you are ready to paint. Step 5: Then dip the brush in the lighter (diluted) area of ink and paint the other areas of the flower, keeping in mind where there would be natural light hitting the flower. The ink will blend into the darker area nicely because the water helps to move the ink. This is the great (and easy) part of watercoloring. It is very easy to achieve nice (realistic) results. Because I knew I was cutting the flower out, I didn't have to worry about keeping the ink inside the lines on this. I was just concerned with making the color realistic. Step 6: Go over any areas that need to be blended together. You can create even lighter areas by dipping the brush in the water (do not oversaturate) and going over the areas that you want to make lighter. 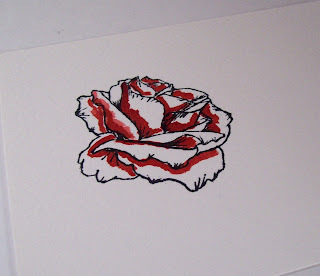 When the ink is dry you can cut out the flower and attach to the card. Watercoloring is one of the easiest ways to get realistic and vibrant colors with very little effort. I think if you try this, you will be amazed at how easy it is to paint with reinkers. Please let me know if try it---I would love to see your creations. Stay tuned: My Favorite Things will be releasing four new stamp sets on Wednesday and I have some MFTeasers to share with you! Your card is just beautiful. Wow this tutorial was so easy to follow. It sounds so easy, but when I go to do it, it seems so hard. But of course I will keep trying. I'm going to try this for sure. Hopefully it will keep getting easier. Can't wait to see the MFT sneaks. Thanks. Some of us need all the tutorials and lots of practice. Yours is so clear. And your card rocks! Your coloring is gorgeous, Cammie!! Wonderful tutorial too!! You make it sound so easy. But I am going to give it a try. Thanks. Thank you, thank you, thank you for your tutorial. Even I can understand it!! Love the card too! Thank you SO much for the tutorial!!!! I don't do watercoloring because of the oversaturation that you mentioned with the aquapainter. Talk about a BIG DUH when you said you use a paint brush! HELLO! Thanks for spelling it out!!!! Hi Cammie! Thanks for reminding me there is another color medium out there! I am severely addicted to my color pencils, even though I have SU stuff, copics and watercolors! After seeing your beautiful work I know I need to spread my wings a bit! Thanks for the inspiration girl! Thank you for the wonderful tutorial! Your card is beautiful. TFS your tutorial, you make it look so easy. I'll have to give it a try. Beautiful card and an excellent tutorial! Thanks for the clear instructions. Cammie - I really appreciated your watercoloring tutorial! And I know I'll appreciate other coloring tutorials to come. This is exactly what I've wanted to learn for a long time, so thank you! Your coloring is always so good and your cards always inspire me that I can attain a higher level of artistry. What a beautiful card! 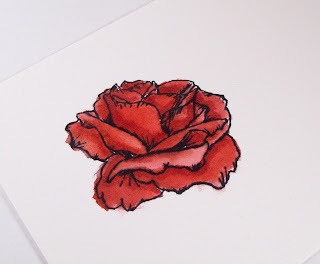 Thank you for the water coloring with re-inkers tutorial...I was jut wondering how people do that! Excellent tutorial and I much appreciate your encouragement to try water coloring. Happy New Year to you! Great tutorial, Camster -- you're making me want to get my reinkers out! Beautiful card yesterday, too. Hugs, girlie! Thanks for the fantastic tutorial, Cammie. You make it look and sound so easy! We'll see how easy it is when I try it! 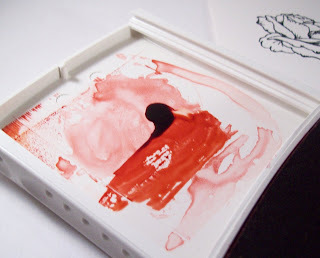 Can you use the SU ink pads and squeeze the top to the ink pad before opening it? (In case you don't have the reinker for a color you want to use.) I've done that before with other projects I've done. Your card is just beautiful, and the watercolour tutorial is great! What a pretty card, Cammie. I love the gorgeous colors you chose! I have tried the Reinker Watercolor Technique and I really love it! I love how you made some of the flowers dimensional. so pretty! Wow!!! AWEsome tutorial Cammie!!! I am gonna give it a try again....I tried once with re-inkers and it didn't turn out well. I'll have to keep practicing as I soooo love this look!!! Thank you for the wonderful tutorial Cammie! Thanks for the tips--your flowers are lovely! Thanks for the excellent tutorial and using my favorite SU products too! Thanks so much for the great tutorial. I am new to watercoloring and have been painting the light first and adding the dark. I can see that this way works so much better! Can't wait to try it!!! Don't they say better late than never. Thanks for the tutorial on water coloring. You make it look easy, but I know it will take me practice time...even though I love coloring with my 64 count box of Crayola crayons!!!!! Great looking card! Wow! Thank you so much for this wonderful tutorial. Your card is just phenomenal! I love how you get such great colors! I wonder how you do the highlighting? Is that just the diluted paint? It almost seems like there is a shine on the highlighted areas. Am I missing something? Or is it the lighter paint after all? Thank you SO VERY much for doing this! I have been playing with watercolors without success. I am sure I will get it with the re-inkers and your helpful hints!